Peacefully on March 28, 2019, at St. Joseph’s Hospital, Thomas Barry Munro of Carlisle at the age of 82. Beloved husband for almost 58 years of Arlene (nee Bogle). Loving father of Carole Daniels (Mathew), Jim (Debbie), and Keith (Dawn). Grandfather and Great-Grandfather of Mathew, and his son Dominic, and Christopher and Maya. Step-Grandfather of Kiran, and also Asha (Kyle), and their daughter Elina. Dear brother of Joan Morgan, Edward Munro (Carole) of PEI, and Wannie Armes. Dear brother-in-law of Sandy and John Michaluk, Lynda Fay and Wilf Phillips, Kathy and Bob White, and Deb and Gary Dobbie. Predeceased by parents Thomas and Edith Munro, parents-in-law Frank and Myrtle Anne Bogle, daughter-in-law Patricia, and brothers-in-law Lloyd Armes and Earle Fay. Born in Carlyle, Saskatchewan, a graduate of Hamilton Teachers’ College and McMaster and Brock Universities, Barry began his teaching at Fairview School in Lowville where he met his wife Arlene. 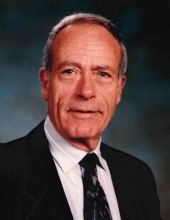 He was Principal at Balaclava, Victoria, Mountsberg, Flamborough Centre, Dundana, and Mary Hopkins Schools in Wentworth County. After retiring, Barry and Arlene travelled to many countries. They spent their winters at their condo in Port Charlotte, Florida within a community of good friends. Cremation has taken place. There will be a private service at a later date. "Email Address" would like to share the life celebration of Barry Munro. Click on the "link" to go to share a favorite memory or leave a condolence message for the family.